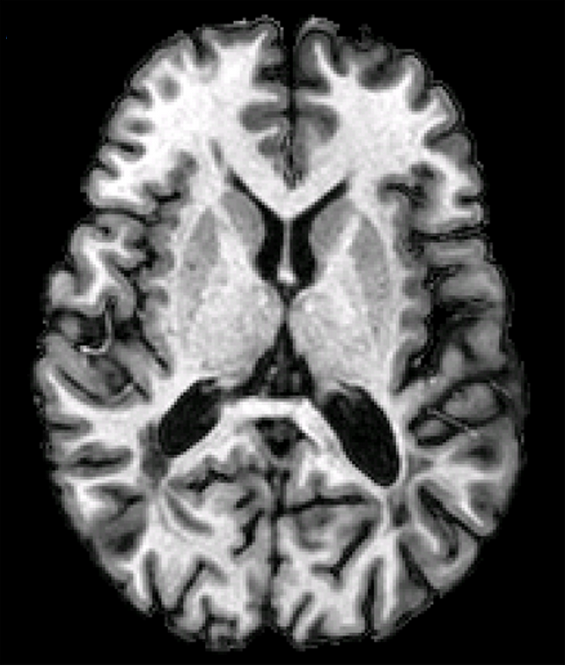 Here’s an example segmentation and T1-weighted image of the brain of a multiple sclerosis (MS) patient, visualized using MIPAV (source: Shiee et al. 2012). You can see all the tissue classes except the cerebellar gray and white matter. Cerebral white matter (25) is shown in white, and cerebral cortical gray matter (15) is shown in orange along the outer border of the cerebral white matter. CSF can be seen in dark red on the edge of the brain (5) and in the ventricles (6). Deep gray matter structures are inside the white matter, close to the ventricles, and are shown in shades of yellow-orange, with the putamen (18) in the lightest shade, the thalamus (17) in the next-lightest shade, and the caudate (16) in the darkest shade. Finally, lesions (10) are shown in red.